St Paul’s Islands seen from Selmun Heights. Blata Steps – a remote cove on the extreme south-west of Malta. 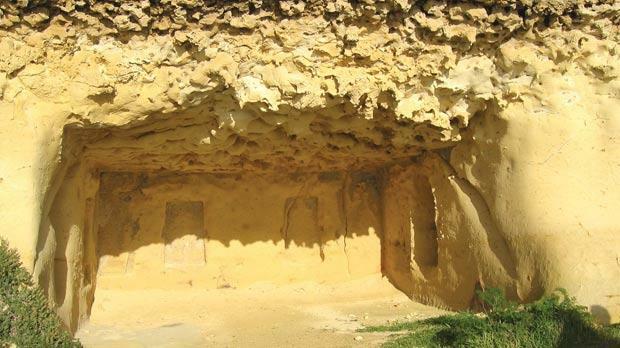 The entrance of the rock-cut sanctuary at Ras il-Wardija (Gozo) showing signs of severe weathering. View from Ras il-Wardija, a remote headland in Gozo. Malta is blessed with exceptional climate and sheer natural beauty. 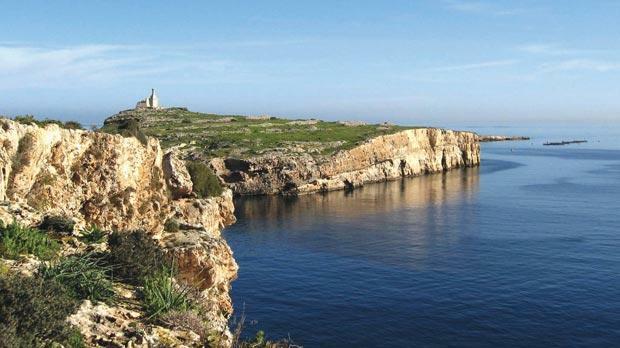 At this time of the year Maltese residents and visitors are urged to put their walking boots on and take in the local landscape in the firm knowledge that ‘seeing is believing’, leading to a better awareness of the rock formations, geological faults, caves, caverns and majestic cliffs that surround our archipelago. The Walks Programme of the Ramblers’ Association at this time of the year includes fine rigorous treks along some of the most spectacular viewpoints in the Mediterranean region. 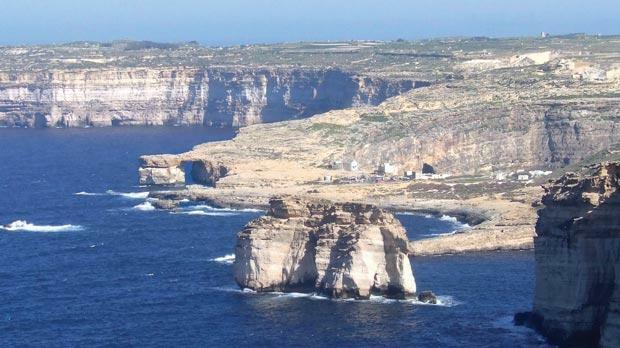 With apologies to the great poet William Wordsworth, “Earth has not anything to show more fair” than the sheer beauty of our cliffs with the blue shimmering sea below and banks of the sweet-scented narċis nearby; or a glorious sunset from the heights of Baħrija as the evening air wafts the wild thyme fragrance across the garigue, home of the Maltese honey-bee. Among the most impressive treks is the Ras il-Wardija Trail leading to a remote promontory on the extreme south-west of Gozo, with idyllic Xlendi Bay on one side and Dwejra , a prospective World Heritage site, on the other. 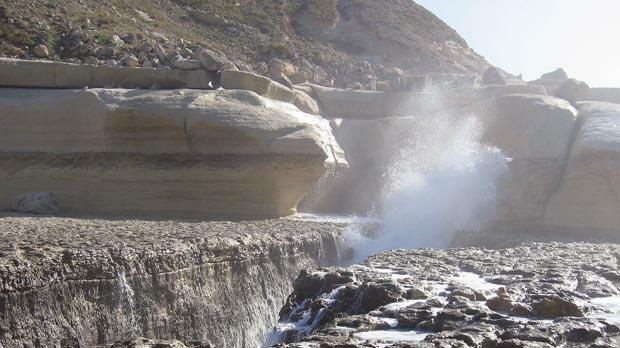 The walk offers spectacular sea and country views with various fantastic rock formations. It is also extremely rich in prehistoric remains, suggesting a strong­ly fortified Bronze Age Village. Severely exposed to the elements, the Roman rock-cut sanctuary shows very clear signs of weathering. The Italian archaeological mission of 1964, in their extensive report on their excavations, seemed to suggest a Punico-Hellenic sacred complex and the possibility of a hermitage in the Middle Ages. A favourite spot for wilderness rambling is the vast expanse of the Mtaħleb/Baħrija area as the walk takes in one of the most spectacular viewpoints and ancient settlements, replete with legends and medieval remains. You trek along high cliff-tops dominated by the Bronze Age village of Qlejgħa tal-Baħrija, with its numerous bell-shaped silos and, further down, stretches the promontory of Ras ir-Raħeb (The Hermit’s Headland), extremely rich in Roman remains. It is also known as Ras il-Knejjes (Headland of Churches), indicating ecclesiastical connections in the Middle Ages. The idyllic inaccessible bay of Fomm ir-Riħ (Mouth of the Wind) with its caves, caverns and pebble beach, beckons below. The most challenging terrain in the area is the steep descent to the rugged cove of mysterious Blata tal-Melħ (Salty Rock) in a secluded remote area. In the south-east of Malta the rugged coastline from the Munxar headland with its famous white cliffs from St Thomas Bay to Delimara presents a vast variety of interesting rock formations, eroded features, and fantastic views punctuated by caves and caverns. Because of its treacherous reefs the foreshore here has been the site of many shipwrecks in the past, vying with St Paul’s Bay for the unique distinction of being the venue of the shipwreck in 60 AD. A small chapel dedicated to St Paul lies in the locality. 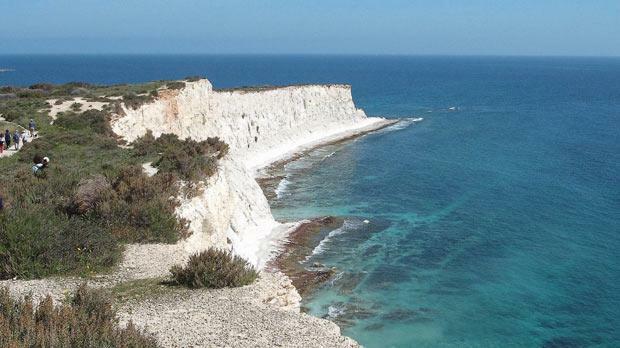 For details about the coastal walks programme visit www.ramblersmalta.org.